Background: Targeting of virulence factors is considered as a novel strategy for antifungal drug development. We have tried to identify potential targets of Indole and Isatin in the Yeast to hyphal induction signal transduction pathways in the human pathogen Candida albicans. Objective: To study changes in gene expression during yeast to hyphal transition in the presence and absence of Indole and Isatin. Methods: Total RNA were isolated by using RNeasy® Mini Kit (QIAGEN) and converted to cDNA by using SuperScript® III for First strand synthesis for RT-PCR (Invitrogen by Life technologies). PCR reactions were done using KAPA SYBR® Fast qPCR Kit Master mix (2x) (BIOSYSTEMS). Results: The genes involved in Yeast to hyphal transition were modulated by the treatment of Indole and Isatin. Our results indicate that Indole and Isatin may target multiple steps in the yeast to hyphal signal transduction pathway. The expression of Ece1 and Hwp1 was downregulated by both the molecules in this study. Hyphal suppressor genes Nrg1, Tup1 were significantly upregulated by Indole and Isatin. Conclusion: Indole and Isatin affected the expression of multiple genes in the yeast to hyphal signal transduction pathway in Candida albicans. In conclusion both Isatin and Indole may represent potential anti-virulence agents against Candida albicans. Indole derivatives could be good candidates for drug repositioning. 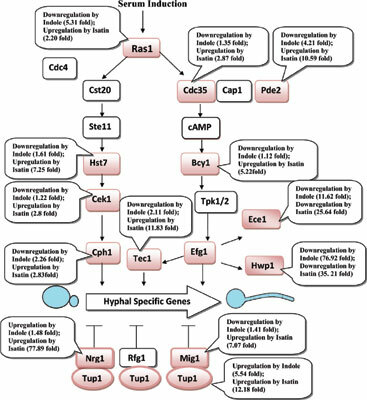 Candida albicans, signal transduction, yeast to hyphal form transition, isatin, indole, Ras1, Hwp1, Nrg1.